NEWFOUNDLAND – Toronto-based Anaconda Mining has extended the strike length of its Stog’er Tight gold deposit to 500 metres. The result was obtained during a 16-hole diamond drill program that probed no more than 40 metres below the surface. A geological maps of the Stog’er Tight area showing the location of surface mineralization (red) at the West and Gabbro zones. Hole BN-16-236 returned 3.72 g/t Au over 4 metres and 2.27 g/t Au over 3 metres. 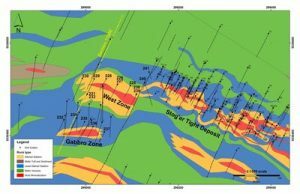 Anaconda’s drill program determined that the West and Gabbro zones continue at depth and are separate. These zones are folded extensions of Stog’er Tight. The company’s interpretation of these drill results indicate that numerous other showings throughout the Stog’er Tight project area may represent fold repetition of the Stog’er Tight deposit. The Stog’er Tight deposit is located 3.5 km from the Pine Cove mill near Baie Verte. The deposit contains an indicated resource of 204,100 tonnes with a grade of 3.59 g/t Au (23,540 oz Au) and an inferred resource of 252,000 tonnes with a grade of 3.27 g/t Au (26,460 oz Au) using a cut-off grade of 0.8 g/t. The deposit is characterized by intense carbonate, albite, and pyrite alteration of gabbroic rocks with gold, strongly associated with pyrite, which is similar to the Pine Cove deposit, said Anaconda. Visit www.AnacondaMining.com and enjoy the gallery of images.